But this has to be my favorite version of a Monopoly game. Ever. (To you humorless lefties, I’m being sarcastic. I feel sorry for the 56-year-old woman.) You gotta admit it has sort of a microcosmic tone of what happened with the government bailout of those overextended in the mortgage crisis. He Wanted These . . . When He Should Have Sought This . 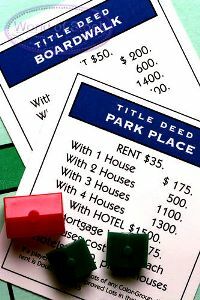 . .
A friendly game of Monopoly turned ugly when a Fraser man hit a friend in the side of the head and knocked her off a chair, knocking off her glasses, when she refused to sell him Boardwalk and Park Place, Fraser police said. Kenneth Reppke, 54, of Fraser was charged with misdemeanor assault and battery in the incident Saturday at a home in the 15000 block of Van, Public Safety Lt. Dan Kolke said. Reppke is accused of hitting the 56-year-old Fraser woman, who was not hospitalized but whose glasses were bent, Kolke said. Hmmm . . . he wanted Boardwalk and Park Place, and instead got the Go To Jail Free card. Oh, wait, that’s a Get Out of . . . .
Never mind. Looks like he’ll need that card, though. I guess if he had been playing Battleship, he would have hurled a grenade. We have too many lunatics running around. You can plainly see the damage liberalism has done, even to Monoploy players. Plainly, if they had both been puffing on big fat cigars this would ever have happened. Gald you moved the site over to WP and canned the Typepad login. 1. Make the theme fluid instead of fixed width for users who only have 19″ monitors; streached to the screen limit, I can only see the left sidebar and 90% of the post, and must scroll right to see the right sidebar. 2. The left sidebar can be reduced by 5px or so, and the balck border between the sidebar and the post also reduced by 10-15px. I think someone should create a new version of Monopoly with today’s economy. With foreclosures, TARP funds, Obama Houses….err HUD Homes, unscrupulous bankers, politicians, loan officers, real estate agents. Liar loans, interest only loans, buy homes with no down payments, adjustable rate mortgages, dumping properties. Hi there, interesting. Check out this short film about the seedy underworld of high stakes board games. Its called Monopolian and its on funnyordie.com.